Sprigs & Twigs landscape designers, led by national award winning Senior Designer, Linda K. Lillie, are passionate about plants and have extensive knowledge about the many plant varieties native to southeastern Connecticut. Each landscape design is created based on your unique property needs. As we professionally design your garden, we consider seasonal interest, year-round color and a wide range of plants to attract birds, butterflies and beneficial insects. Using local native plants minimizes maintenance and promotes sustainable landscapes. Sprigs & Twigs landscape designers present our one-of-a-kind designs at our customers' home or at our office. 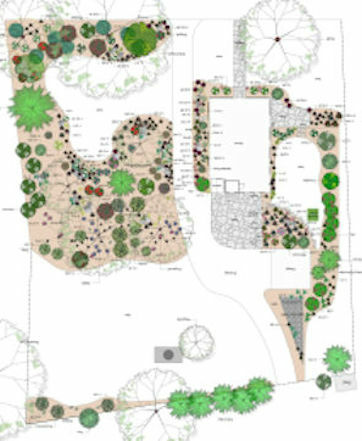 It includes an architectural rendering of your property, a review of each phase of the landscape design process, detailed plant list, and color pictures of all of the plants selected for your landscape design. A digital copy of our presentation is given to every customer for further review. Sprigs & Twigs provides an environmentally-friendly, sustainable landscape installation with essential elements such as the preparation of the soil and planting beds. We also improve and treat the soil with organic compost, organic fertilizer and beneficial microbes. We only use high-quality nursery stock in our installations and we offer a one-year guarantee on all plants that we install. We use natural brown, bio-degradable mulch to cover the garden beds. The single most important element in maintaining any landscape is consistent maintenance. Sprigs & Twigs' professional, extensively trained staff works hard to maintain the natural beauty of your landscape through quality maintenance and expert care. Sprigs & Twigs offers a complete range of Gales Ferry CT landscape maintenance services from single visits to weekly maintenance throughout the season. We refresh and refurbish older landscapes, provide landscape renovation and restoration services, and seasonal services such as a Spring Spruce Up and Fall Close Down to prepare gardens for the season ahead. Sprigs & Twigs also provides absentee owner and property management services. Our maintenance services consist of pruning, weeding, edging, mulching, fertilizing, planting, and transplanting. 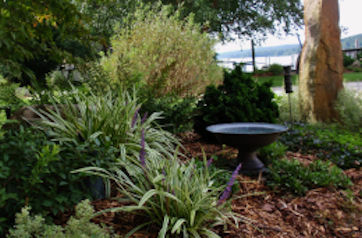 Sprigs & Twigs offers online access to your custom Gales Ferry CT Landscape Design Portfolio. Now you can view the latest design files for your property whenever you like. Rain gardens are an environmentally-friendly solution that uses a landscaped basin to capture and soak up water that runs off your roof, driveway, walkway or other hard surfaces around your home. 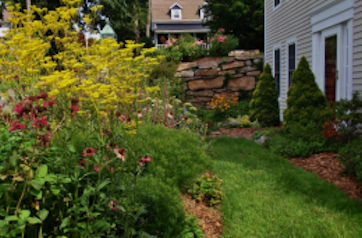 A rain garden is planted with native trees, shrubs, flowers and other plants that thrive in an occasionally moist area. When a rain garden is added to a yard or garden, it collects rain water like a sponge and allows it to slowly filter into the ground rather than becoming polluted storm water runoff. "Thank you for the wonderful landscaping job you did for us. You converted an overgrown patch of weeds into a lovely, low-maintenance border of beauty. Linda was delightful to work with and a gifted landscape architect, she envisioned what was needed. This project was completed in just two days and the results are breathtaking! We look forward to working with Sprigs & Twigs on more projects in the future and will highly recommend your company to everyone we know." Clinton, East Lyme, Essex, Gales Ferry, Groton, Guilford, Ledyard, Lyme, Madison, Montville, Mystic, Niantic, Norwich, Oakdale, Old Lyme, Old Saybrook, Pawcatuck, Preston, Quaker Hill, Salem, Stonington, Uncasville, Waterford, Westbrook, and Westerly RI.